Who says stroganoff has to be made with pork or beef? 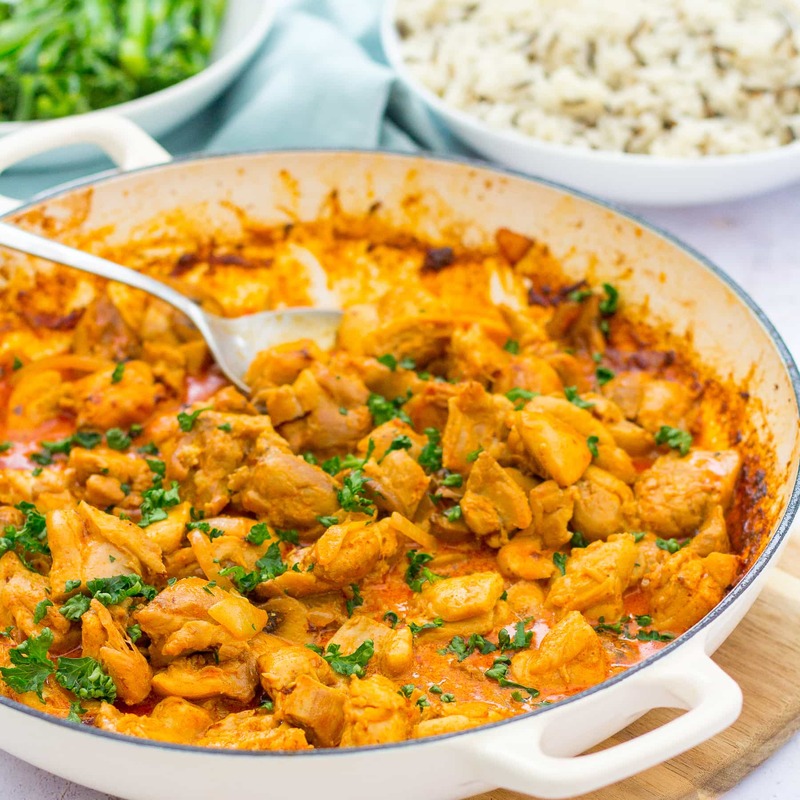 This Easy Chicken Stroganoff is packed full of flavour, but super speedy to make – just 20 minutes from start to finish. Perfect for an easy peasy midweek meal! 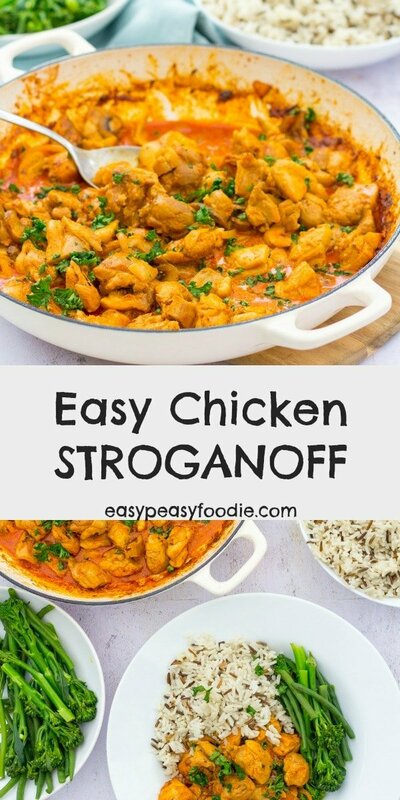 Can stroganoff be made with chicken? Yes, absolutely! And what’s more, it’s absolutely delicious – and quick! If you are a regular round here, you’ll know that one of my favourite things to do is to take a classic recipe and play with it a bit – sometimes to speed it up, sometimes to make it more delicious and nearly always to make it easier! 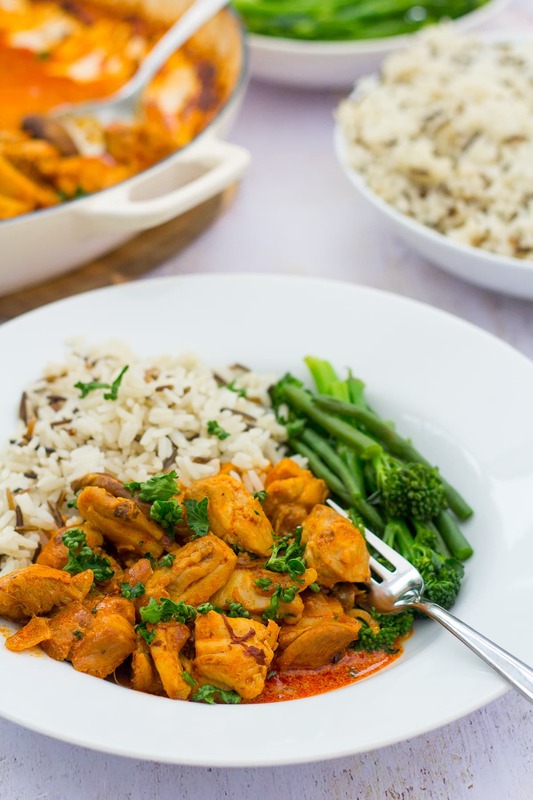 In this case, I am taking a totally classic – stroganoff, usually made with pork or beef, and giving it an easy peasy foodie makeover by making it with chicken instead. 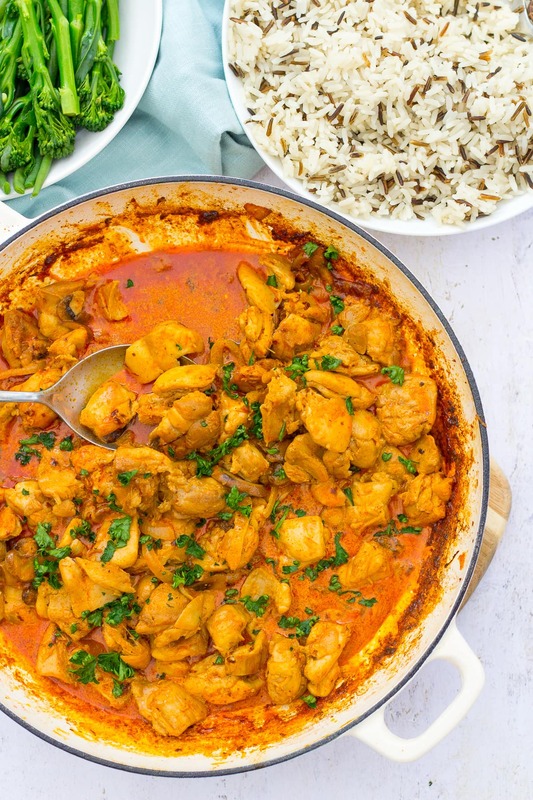 This makes it a really great midweek option – cheap, quick, easy AND budget friendly! Plus, it’s great for anyone who just prefers to eat chicken! My Chicken Stroganoff is so quick and easy to make. Simply pan fry onions, mushrooms and diced chicken (breast or thigh, whichever you prefer – my preference is for chicken thighs! ), add delicious smoked paprika, soured cream, parsley and plenty of black pepper, then serve! It’s all done and dusted in under 20 minutes. What to serve with chicken stroganoff? I like to serve my Easy Chicken Stroganoff with rice and green vegetables, such as green beans or broccoli, but you can serve this delicious dish with mashed potatoes, pasta or crusty bread if you prefer. 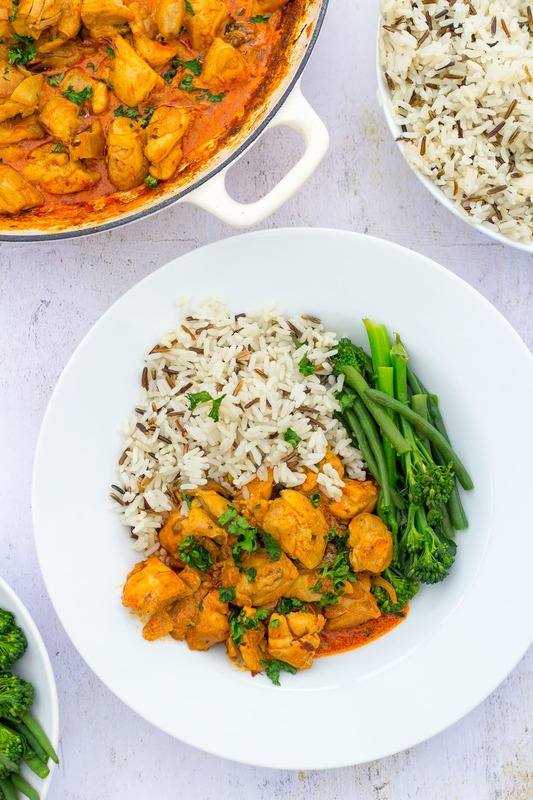 If you want a low carb version, you could just serve the stroganoff with lots of veg on the side! What to drink with chicken stroganoff? 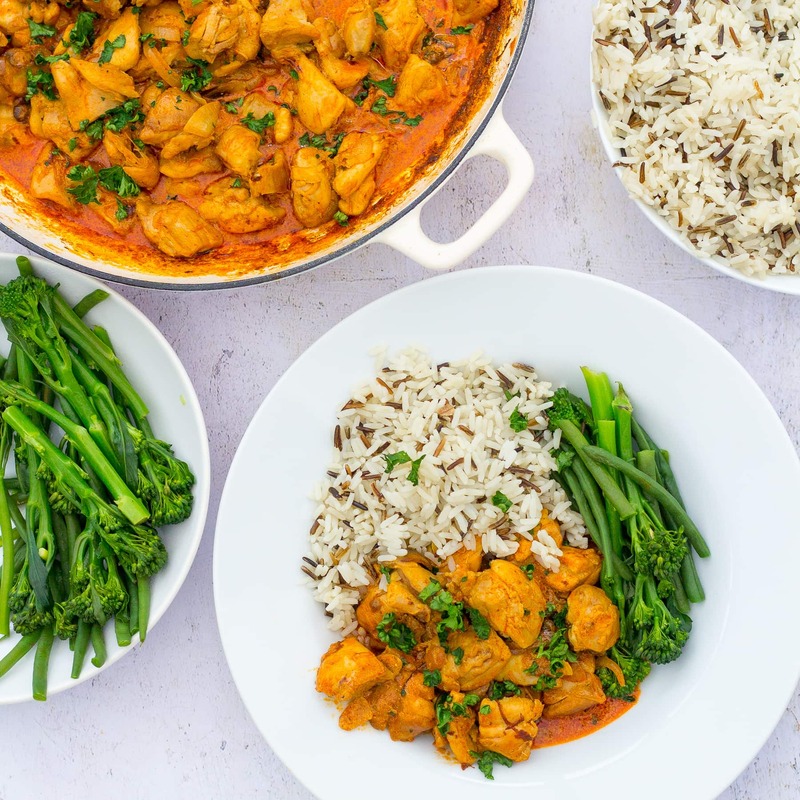 My Easy Chicken Stroganoff is great with an oaked Chardonnay from somewhere like the California or Australia, or a zingy sauvignon blanc from somewhere like New Zealand or Chile. Can chicken stroganoff be reheated the next day? Absolutely. Place the cooled chicken stroganoff into a plastic lidded container and keep refrigerated. It will keep in the fridge for 3 days. To reheat, simply place the stroganoff into a saucepan, together with a splash of water and bring to the boil. Reduce the heat and simmer for 5 minutes, until the chicken is piping hot. You may find the sauce ‘splits’ slightly if you do this, but this will not affect the flavour. Alternatively, you can reheat the stroganoff in the microwave, if you prefer. Yes, it can – although the sauce may split. This won’t affect the flavour though! To freeze, simply place the cooled chicken stroganoff into a plastic lidded container and put it straight into the freezer. It will keep in the freezer for 1 month. Fully defrost first before reheating (as above). Put a tablespoon of olive oil in a large frying pan and heat for 1 minute, add the diced chicken and cook over a high heat for 5 minutes, stirring frequently to ensure it is nicely browned all over. Tip the chicken and all the juices onto a plate. When the onions and mushrooms are cooked, add the garlic, paprika, salt and pepper, plus the chicken and all the juices and cook over a low heat for a further 3 minutes, or until the chicken is cooked all the way through. Add the sour cream and heat gently until it just starts to bubble (don’t boil!). Turn the heat off and stir in the chopped parsley. Serve with rice, pasta, mashed potatoes or crusty bread and green vegetables. In my opinion, this recipe tastes much nicer with diced chicken thigh, however if you prefer chicken breast, then that’s OK – the recipe works just fine with diced chicken breast! Gosh this sounds delicious Eb! I love it’s versatility too. What a fab mid week meal absolutely full of flavour. Thank you for sharing it with #CookBlogSare. Love the colour and smoky flavour of this dish! I am looking for new freezer meals which I can make in advance for weeknights so this is going to be tried for sure! Stroganoff (in any form) ranks up there with my favorite foods on Earth. In fact, I’m making beef stroganoff tonight! If I hadn’t already gotten my family’s tastebuds set on that, I would definitely make your version with chicken. Absolutely yes to chicken thighs, and making the dish in advance will give the flavors a chance to deepen. I’m pinning this to make next week! What a good idea. I love stroganoff but hardly ever make it as it takes too long. It will be on the menu from now on!